“Feasting is closely related to memory. After brain-dumping, and going back through all my notes and old Disney pictures, I had quite a list of food to share. I decided that I would break the food posts up into four posts, covering both the Disney Parks (Disneyland and Disney World). Part One will be Magic Kingdom and Disneyland. Part Two will be Epcot and Animal Kingdom. Part Three will be Hollywood Studios and California Adventure. Part Four will be Downtown Disney and Disney Springs. I decided to do it in this order to 1) compare the similar parks and 2) have information available for people who would be going to either. Also, everything listed here is food that I have personally eaten, unless otherwise noted. I included a few notes about foods we don't like, as well as some we've heard much about but haven't had yet. It's hard to beat the Disney Food Blog for this category, but it's almost too much information for even me! 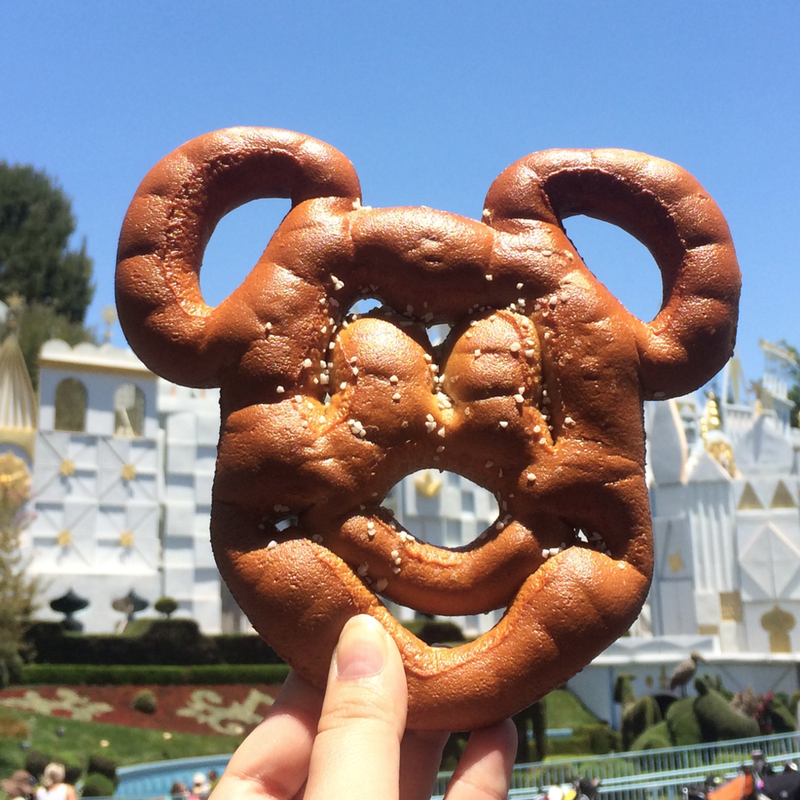 So I'm hoping this bite-sized (*ka-doosh*) version of Disney food recommendations is helpful and functional! Happy Memories! The "top-tier" expesnive restaurants that are hard to get into... they are all outstanding. Starting center, with Main Street, and working in counter-clockwise order: TomorrowLand, FantasyLand, Liberty Square, FrontierLand, AdventureLand. This is an expensive meal, but truly delicious. The options of the buffet are salivating and adrenaline-producing. The characters also roam around and greet tables, so the experience is hard to beat! If you time it right you can actually stand on the front porch and watch the fireworks with no crowd-pushing or lots of waiting around! I like the kill two birds with one stone like that. Casey's foot-long is one of the best deals in the park, and they have a rotation of "featured dogs" that are usually top notch. This last time I had an Asian-inspired dog with slaw, chili sauce, and egg roll noodles. If you're getting a hot dog for your child just go to Liberty Market... they have them there for a few dollars less. The buns are too big, but I solved this by removing one half of the bun and having an "open-faced" sandwich. The insides are both delicious! That coconut cake is one of those things I'll crave at a time when it's not remotely possible to get into the Magic Kingdom and buy one... and it stays with me until I get it! Hard to beat once the chill of nighttime sets in! Warm, ooey, gooey, wonderful. Another Caleb find! I'm not a seafood person... but I am a cream and cheese and good-seasoning person. This chowder really is outstanding. I loved the salad too... just ask for extra dressing. It's a little on the "lots of chewing" side. If you can only eat "one nice/expensive meal" at Disney... eat here. Salad, warm rolls and honey butter, pork, turkey, roast, green beans, gravy, mashed potatoes, stuffing, mac-and-cheese, cherry crumble, ice cream... bottomless family style. It's one of our all-time favorite meals and MUST be eaten late in the day so you can fill up, and go crawling back to your hotel bed and sleep. It's a Thanksgiving meal. Obsessed. These both are very satisfying and "sit" in your stomach... we love to get one and share bites of it! A great pick-me-up and keep-me-going kind of snack! The flavors of the sandwich, especially, are a great mix of comfort food with "Hm, that's a little different!" Alright. This is the recommendation that probably comes with the most cautions. The food isn't "aaamazing" but... you get a LOT (at least in Disney measurements). We like the fajitas and salad the best, but everything needs a little doctoring: squeeze some fresh limes, add salt and pepper, etc. It's a bit bland on its own. The part that wins us, though, is the huge toppings bar (basically self-serve Chipotle style) where you can get lots of extra protein, flavor, and veggies. We can order one fajita platter, load up on toppings, and be very satisfied! So, take with a grain of salt... literally. $4.50 for two, relatively not messy, easy to eat, crunchy, and delicious! One of the best little snacks in the park! - Pinocchio Village Haus... everything. We've never really enjoyed anything from here. And it's in one of the most crowded locations in the park. Same order as before: Main Street, and working counter-clockwise: TomorrowLand, FantasyLand, New Orleans Square, FrontierLand, AdventureLand. I'm obsessed with both pickles and breaded-fried-foods. This does NOT disappoint. We ordered a second batch the first time we had them! These corn dogs are legendary... and they shouldn't be! I heard a story once, in a Disney documentary, that the Disney staff had been hearing so many raving reviews about "these incredible corn dogs!!" A bit confused by it, Walt was pleased! The corndog batter was made from a regular bag of cornmeal/etc and was just the cheapest stuff they could find. He wanted to do his dear customers a service and decided to make the corn dogs worth their reviews! He hired a world-class chef we prepared a secret recipe that included whole corn kernel being ground while fresh. They launched his new, gourmet, actually-prize-winning corndogs... and they have never had so many complaints in a single day in the park's history! People were livid! So the original, boring, well-loved corndogs came back, and they have been here ever since. And they ARE so good! I get one every single time I'm in Disneyland! We were surprised at how much we loved this meal! The chicken wasn't soggy or dry, the gravy was outstanding, the vegetables were crisp and well-seasoned... and there was a LOT! Three chicken pieces with one order! We made Rowdy a little "chicken biscuit sandwich" out of one piece, then Caleb and I each had one ourselves, sharing the green beans and potatoes. It was hearty! And very good. It's nice to feed the family lunch for less than $20! Tart, not too sweet, crisp, foamy... this iced drink is an all-time favorite (ask for only one pump of syrup. Two is too much!) The flaky, warm, chocolate twists are killer too! While I'm not a Dole Whip fan, I AM a pineapple lover. It's a simple treat that could be made at home... but the cold fruit with the crunch of dark chocolate... hmmm... it gets me. If you eat anything in Disneyland, you have to have this meal. It's unique, flavor-full, filling, and fits the atmosphere and expereince perfectly. There is a little order window in the back where you can walk up to order beignets (instead of standing in line at the restaurant). One of our favorite things to do: get an iced coffee and piping hot Mickey beignets! They are cloud-soft and puffs of steam fizzle up when you bite into them. Gah. The churro is a must-try... but this churro-funnel cake is the next best thing! Caleb and I agree that these skewers are probably our favorite snack in the whole park. We tend to get some in the late afternoon when light protein is just what you need. The little shack they are made in is open air, so when you come around the golden-hour corner of Adventureland with tiki island music playing... and the smells of fire and smoke and meat wafts through... it's impossible to resist. And they are GOOD. Load up! If this place wasn't at Disney and was just a restaurant nearby, we'd go for dinner all the time! Hopefully this is helpful! And for other Disney-lovers, feel free to leave your favorite food and drinks in the comments... it's hard to get to everything! It takes a village!